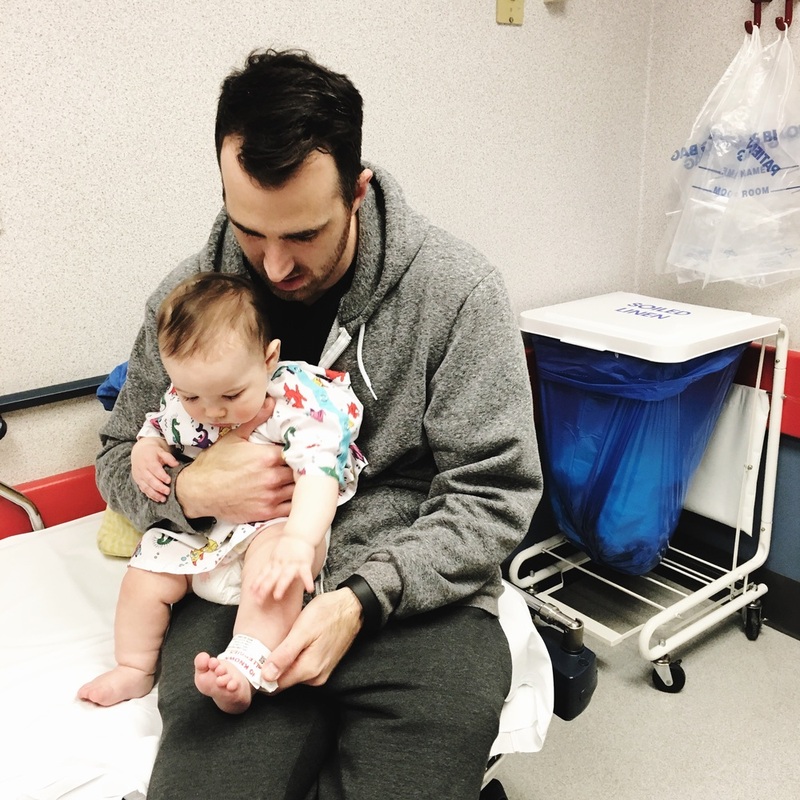 I knew Finch would be the first kid to put us in the ER - I had even told some friends that recently - but I really thought it would be in a couple years and be injury-related. If you follow me on Instagram, you know we've had a crazy week! Let's back up, to Monday afternoon around 3:00 pm...Finch got a fever at daycare so I brought him home and was able to nurse him and get him down for a nap. He seemed to be fighting something off but definitely not unusual at this point. But when he woke up an hour-ish later, I noticed he was breathing really quickly and could see his stomach moving quite a bit trying to get air. I immediately had a worried feeling in my stomach and tried to get him to relax by holding him on my chest and breathing slowly, taking him outside, turning up his cold air humidifier and putting his face right in the steam, essential oils, chest rub, etc. None of it was helping. I got him to sleep for a very short time on my chest while googling "labored breathing baby." He wasn't croupy so I was worried it may be pneumonia. When he woke he couldn't seem to relax enough to nurse, wouldn't go back to sleep, and in general just looked like he was working very hard to breathe. His little heart was racing and his fever was rising. Eric tried to rock him to sleep as well, but was unsuccessful. After four hours I was getting more and more worried and didn't know how long his little body could sustain this. We were lucky to have "missed the rush" at the ER and got seen within an hour. His oxygen levels were good and I finally got him to nurse in the waiting room. They cleaned him out with a vacuum suction and said sometimes that's all they need to really start to improve. I started to think we were going to be sent home and be off the hook! Then we saw the doctor, who diagnosed him with bronchiolitis and double ear infection, and admitted us to the hospital. He said if we were sent home, we would be back in a matter of hours. Deep down I knew he was right. I was actually relieved that we would be staying and not having to go home and worry all night long, but bummed for Finch that it really was that serious. We got to our hospital room around 2:00 am and we were able to rock him to sleep. I think by then the fluids and oxygen had helped his body relax a little. Eric left to go home to sleep and get Rooney off to preschool the next morning. I held Finch all night. His breathing was still fast and labored into the morning. I can't exactly remember when it stopped, maybe around 10:00 am? By that time Eric was back and we had already had three people come and pray over him, and tons more praying from afar. He was nursing awesome; I kept putting him on the breast whenever he cried because I knew it would comfort him and that he needed to stay hydrated. And he started smiling again, which was the best thing ever for my tired eyes and sad mama heart. From there, things just gradually kept getting better. We spent the day mostly just nursing and sleeping. About 24 hours after the symptoms started, he was showing signs of wanting to play with toys, get down and crawl around, etc. He couldn't do much because of all the cords hooked to him, but he was definitely trying to jump out of our arms. They removed his IV because he was eating well and also started to wean him off oxygen that evening. The doctors were very impressed with his improvement, as well as his strength and his awesome smile. The following day they kept lowering his oxygen and checking his vitals to make sure he was handling it OK. About 4:30 pm they gave us the option to stay another night or go home. We were out of there within the hour! Honestly, it sucked and there is a long list of things I could complain about. We had to share a room at the hospital, and they did not want us to fall asleep while Finch was sleeping on us (for safety purposes) and since he wouldn't let me set him down, I basically didn't sleep much for two days. I cried a few times, feeling so exhausted and sad for my little buddy. 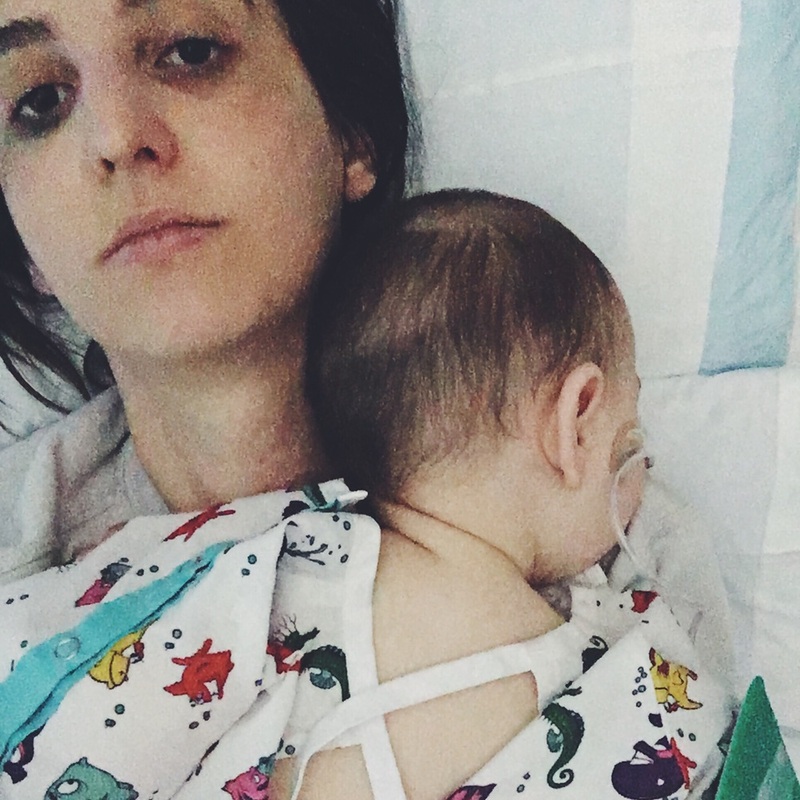 One of the hardest parts was that he was hooked up to an IV, oxygen and pulse monitor - three different cords coming off of him - which made it hard to hold him and you also can't really leave a 10-foot radius because the cords aren't very long. They were out of hospital beds so I slept on a cot or pullout couch - neither of which were easy for nursing. But we were only there for two days...I can't imagine those families who have to spend much more time there. It was incredible how bad he got so quickly, and also how quickly he got better. There is no way I could ever repay everyone for how they stepped in and helped us without hesitation. We had four of our church's pastors visit us, prayer warriors praying, lots of texts, and people helping us with Roo and delivering coffee and cookies. We even had dinner waiting for us at our house when we were discharged! It was simply amazing. When you don't have family closer than 45 minutes away, you have to create your own family community...and sometimes you don't realize how many awesome friends and co-workers you have until you really really need them. Like someone who will drop everything and come to your house at midnight to lay on your couch to be with your toddler. I am also so thankful for Blank Children's Hospital - that we live so close to an amazing children's hospital and all the wonderful staff we had. It's now Saturday, and we are finally catching up on our sleep. Praise God. We have never been so happy to be home!